Here are some helpful tips on how to protect yourself from ticks. tick prevention products. Use insect repellent with 20% - 30% DEET on exposed skin and clothing to prevent tick bites. Permethrin is a type of repellent that kills ticks on contact! One application to pants, socks, and shoes typically stays effective through several washings. Permethrin should not be applied directly to the skin. Soaking your clothes in a permethrin solution offers the greatest protection. Wear light-colored long pants, long sleeves, and long socks. This will help you spot ticks more easily. 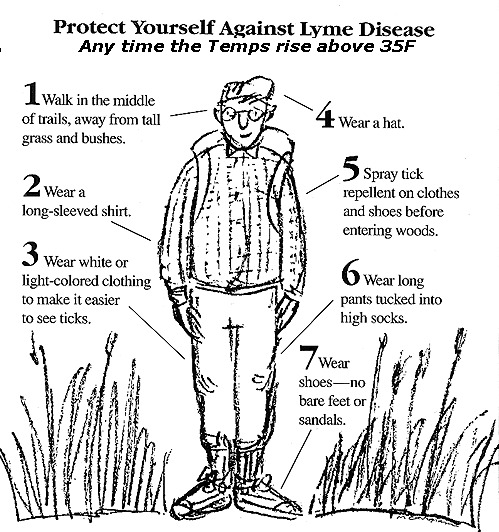 Tucking your pants into your socks and your shirt into your pants is an effective way to keep ticks on the outside of clothing. Remove ticks from your clothes before going indoors. To kill ticks that you may have missed, simply throw your clothes in the dryer on high heat for 30 minutes. Your risk for contracting any tick borne illness increases the longer the tick is attached to your body. Ticks prefer wooded and bushy areas with high grass and a lot of leaf litter. Take extra precautions in May, June, and July. This is when ticks that transmits Lyme Disease are most active. Ask your local health department and park or extension service about tick infested areas to avoid.